This February 29, leaplings are receiving a birthday gift from Applebee’s. Leap Day babies who celebrate their birthday on Monday, February 29 at any of the 67 Potomac Family Dining-owned Applebee’s will receive a free entrée and Hot Fudge Sundae Dessert Shooter. Guests will receive the special offer by showing valid government identification. Leap Day-born guests will have the option of selecting any entrée of their choice, such as the new Beer Garden Burger – the newest addition to the All-In Burgers® line-up – which features bacon and onion seared into 100% fresh ground beef, topped with craft beer cheese, white cheddar, maple mustard and sweet & spicy pickles. Guests will also be able to sweeten their meal with a complimentary Hot Fudge Sundae Dessert Shooter. 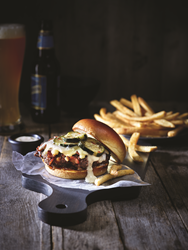 Applebee’s Leap Day special is an effort to thank Leap Day-born guests for their loyal patronage and celebrate their unique birthday that only comes every four years. *Offer valid 2/29/16. Dine-in only. Limit one entrée and dessert shooter per guest per day with valid government-issued ID showing a February 29 birthdate. Valid at Greater Washington, D.C., Richmond, Shenandoah Valley, Hampton Roads and Elizabeth City area Applebee’s. Guests should call their local Applebee’s to determine participation. Applebee's is the world's largest casual dining chain, with more than 2,000 locations in 49 states, 16 countries and one U.S. territory. Based in Glendale, Calif., Applebee's offers a lively bar & grill experience with an array of flavorful, hand-crafted drinks, appetizers and entrees that constantly evolve. Applebee's Grill & Bar® restaurants are franchised by DineEquity, Inc.
Potomac Family Dining Group (http://www.potomacdining.com) owns and operates 67 Applebee’s Grill & Bar® restaurants in the Mid-Atlantic region, including Virginia, Maryland, Pennsylvania, West Virginia and North Carolina. Headquartered outside of Washington, D.C., Potomac is focused on delivering a personalized, fun, friendly, carefree dining experience. Potomac Family Dining is also dedicated to ensuring that each location is reflective of its neighborhood and provides local residents, business professionals and travelers with a true neighborhood experience.